Is it the gold fever or is he just nuts ? 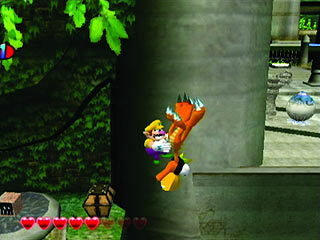 Are you afraid of ghosts, Wario ? He wanted so much to be in Smash Bros. Melee ! He's a mean fat little guy, he's ugly, dirty, ill tempered and he loves putting his finger in his nose, it's... Maaaario ! Oops, wrong lettering: it's... Waaaario ! And currently, he's also bloody rich. Hunting treasures in several Game Boy titles made him so rich that his freshly built castle is overflowing with gold and jewels. Thanks to his wealth, he set up his own game company Wario Ware Inc., and he can even afford his own GameCube game just like any other Nintendo star. So now he's just laughing, laughing out loud in the middle of his gigantic fortune, because he knows that's what Bill Gates and Scrooge McDuck do too. 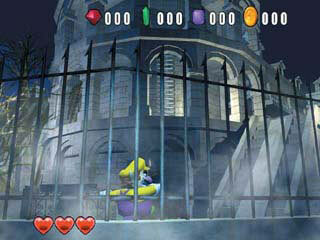 However, what he doesn't know is that deep inside the castle lays a dark jewel which is very evil, even more than Wario himself. 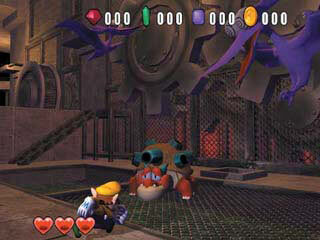 One day the jewel awakes and turns all Wario's treasures into monsters. Of course that makes Wario awfully angry, he just wants to beat up all these monsters to get his treasure back and, as a matter of fact, that's exactly what he has to do. He will definitely have to punch hard, there are tons of enemies ahead and 12 bosses, but he won't have to walk much with only 4 worlds and 2 levels in each. That suits him well, but does that suit the player ? Wario World is a short and pretty easy game: 8 levels only of small/average size, and nothing really challenging in them. Monsters are almost friendly, taking time before aiming a blow, and platform elements though fairly entertaining in the sub-levels are way too restrained and simple. In this game, it's even difficult to die, for instance you can never die by falling in a chasm. It's an interesting idea but it ruins the difficulty. In the sub-levels, when you fall, you just start from the beginning, without losing a single little piece of heart, not even a life, there's none anyway. In the normal levels, falling leads you to a dark cave. There, you have to find the exit hidden in a box while avoiding ghosts and water which take you coins. Coins are very important as you use them to buy energy and continues. 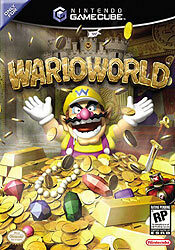 You also have to collet 8 treasures, 8 diamonds, 8 pieces of a Wario gold statue... 8 seems to be Wario's lucky number. Well, there are only 5 sprites to save in every level. 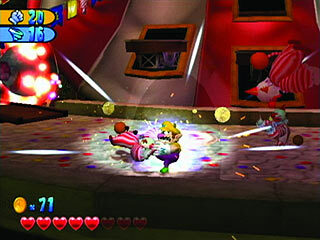 The sprites give you clues, the diamonds access to the boss and the treasure the leisure to use the Game Boy Advance connection to download some Wario Ware mini-games. Once you found all this, you can proudly say that you fully completed a level. This is not so hard, it won't take you long if you're familiar with that kind of game. Obviously, Wario World is not targeted to such an audience but rather to children and beginners, the ones who complained the most about Super Mario Sunshine's difficulty... Even these people though, will most likely rant about the graphics. Wario World has been developed by a small team with a little budget, the lenght of the game says it all and so do the graphics. 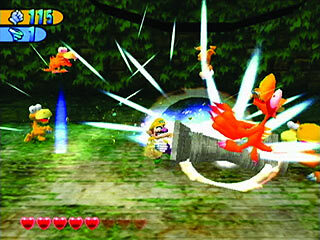 Lacking both smoothness and texture, they also show little style with dramatically unoriginal backgrounds and enemies. Fortunately, there are several ideas in the gameplay mechanics and a few good surprises (the snow level is quite nice) which make the whole experience rather enjoyable. 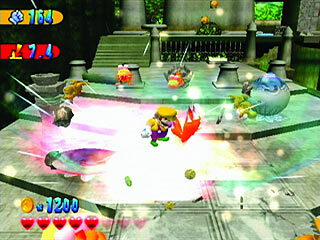 Wario controls well, it's easy to smash pack of enemies, dash into them or pick up one and use him to clear your way while spinning. Besides, and that's one of the good ideas we mentioned above, such attacks can also be useful to interact with the level and progress in the game. Interestingly Wario World is not a free roaming adventure like Mario Sunshine, you do have some freedom but you mostly go in one direction, every level has clearly a beginning and an end. The camera therefore is used only in the sub-levels even then it's hardly moving; the rest of the time, the C stick is use to push the screen a little forward, a bit like in the old games, Sonic for instance, when you could press up or down to see further. Poor graphics and unimaginative visual style, a too simple challenge, only a few short levels... hey, come back, the game is not condemned yet ! 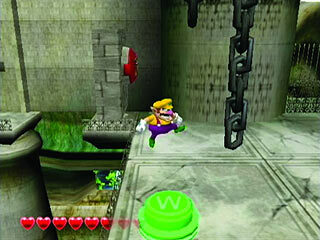 Despite some major shortcomings, Wario World plays well and doesn't totally fail to entertain. It depends also how tolerant you are towards titles like this which neglect so much their presentation to focus on the game alone. 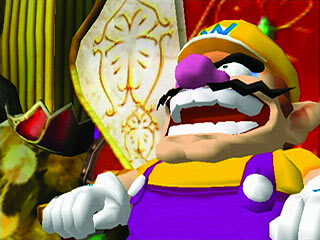 Wario is a funny character and just to hear him shout "get out of here ! ", "vonderful ! ", that cheers you up. Sure, that's not enough to make a good game and Nintendo/Treasure could have come up with a much better game with a character such as Wario. 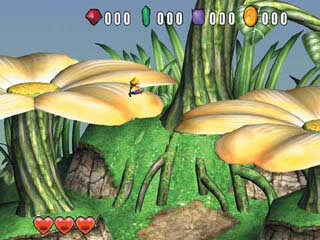 The most unforgivable aspect of Wario World though, is how little it has to offer. Even 10 years ago the game would have been criticized for being so easy, short and shallow. For this reason, because games are supposed to be something more than a trial version, especially after being developed for more than a year, we show no mercy for the final score. Nintendo seems to think they can fool players by selling badly done games behind a famous character; that kind of attitude won't help them at all and might make them lose respect from gamers. 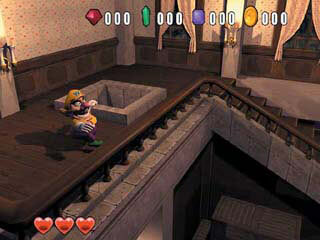 "Deep within Wario's castle lies a treasure room filled with the spoils he has plundered during his many adventures. A mysterious black jewel, ensconced among the treasures, has a strange power to transform gems into monsters. While Wario rests in his castle upstairs the jewel begins to morph his treasure trove into a host of monsters, turning the basement of Wario's beloved castle into a bizarre parallel universe. Awakening the next morning to monsters instead of treasure, Wario must step into that alternate world to win the treasure back." 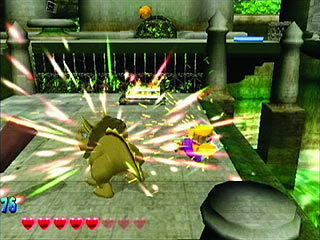 "- Join Wario as he takes on his first starring role in a 3-D action game for Nintendo GameCube. 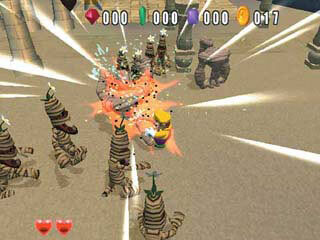 - Experience a new type of side-scrolling action game as Wario World pushes the genre's boundaries. - Run, jump, punch and grab just about anything; even swing objects around and hurl them to break open new areas or defeat enemies. - Pile drivers, head butts, and a variety of over-the-top fighting moves to battle an endless tide of weird and wild enemies. - Balance atop mysterious floating balls that have sticky surfaces and jump ball to ball to reach new areas. 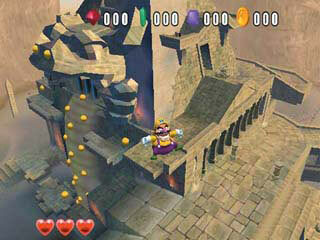 - Zip through wonderfully detailed levels and quirky puzzles to restore Wario's precious stolen treasures."